We provide a rolling programme of high quality exhibitions at our gallery in The Centre for Contemporary Printmaking. We also tour exhibitions to venues regionally and internationally. Joanne fitzpatrick graduated from the Belfast school of Art in 2000 with a BA Hons Degree in Combined Studies in Art and Design - she specialises in Printmaking, Painting and Photography. She completed a PGCE in Art and Design at John Moore’s University in Liverpool and is currently Head of Art and Digital Arts at Hazelwood Integrated College in North Belfast. 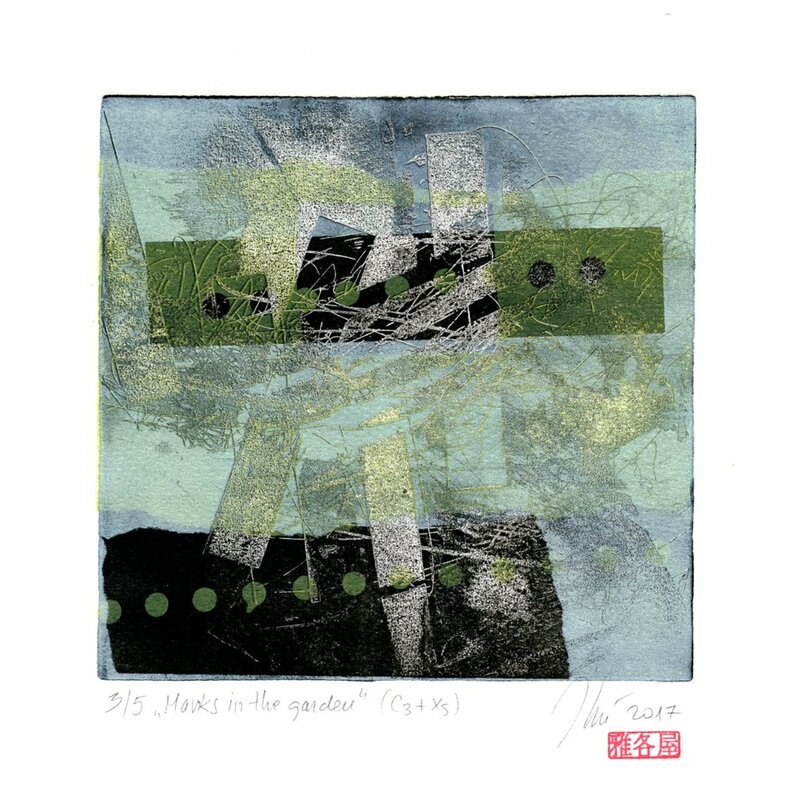 Joanne is a relatively new artist member at Seacourt and she has experimented on a range of printing techniques and processes. Her current exhibition in our Member’s Gallery ‘Botanical Restoration’ predominantly reflects the changes that have occurred in the Tropical Ravine in The Botanic Gardens, Belfast. Joanne documents the light, space and texture, spontaneously recording the changes that unfold in the architecture and plants during this observance of the passing of time. Mark making is prevalent throughout her work and she enjoys infusing and overlapping line. Joanne uses loose vibrant brush strokes in her Cyanotypes to enhance depth and to emulate the subtle complexity of the natural forms. Her aim is to provide an expressive painterly flow throughout her printmaking. To celebrate Creative Peninsula and August Craft Month 2018 our members are presenting work that shows the diversity and dynamism of printmaking and some of its many applications beyond the traditional fine art print. Seacourt's members have expertise in specialist printmaking techniques from photo intaglio and lithography to etching. The diversity of techniques and their application in art making and craft reminds us how accessible printmaking is - to learn and experiment with or to own and enjoy. The work on show reflects this variety of working methods and the creativity of our Artists. Intricate 3D construction work using etching and screenprinting; Relief print on ceramics; Vibrant screenprinted textiles; Original screenprinted products to use or wear and original bespoke festival posters. We hope you will enjoy this eclectic selection of work that truly shows the breadth and depth of the possibilities of printmaking. 'DIVERSITY in Print' runs from August to October. Reis was born in Bangor, UK. She has recently graduated with a BA Hons Degree in Fine Art Printmaking. Reis is a multidisciplinary artist, she uses the tools and techniques of science in her creative process to make art informed by printmaking. The artwork explores the relationship between art and science, specifically observation, experimentation, method and calibration. She is driven by the curiosity of how scientific process can be used to produce artwork that emphasizes creative aspects of the disciplines working together. This began with the use of bacterial cultures and food dyes which developed further as an inspiration for mirroring the natural process and manipulating it to achieve desired outcomes. Through trial and error, the process has been refined using various methods to produce an effect that pays homage to the natural processes initially experimented with. This technique has led to the use of gelatine, ferro fluid, toner inks and selective exposure to produce a range of textures and colours. At Seacourt, The Centre for Contemporary Printmaking, we are delighted with the huge response to our Mini Print Biennial 2018. The exhibition showcases the work of 140 artists from over 30 countries displaying a wide range of printmaking techniques and exceptional printmaking skills. An exhibition not to be missed. Elena Carrasco: "China Dogs and Other Tales / Perros de Porcelana y Otras Historias"